May 29, 2018 | 12:30 p.m. The Epic Systems corporate campus in Verona, a suburb of Madison, covers hundreds of acres and includes multiple office buildings. Epic Systems, the resident tech giant of Wisconsin's left-leaning Dane County, sits uneasily on its sprawling campus just outside of Madison. The electronic health records company is seen locally as an agent of change for both good and ill, boosting local ambitions to become a tech powerhouse, attracting young and well-educated workers to the area, and contributing to increasing housing costs in Madison. Epic has also become increasingly associated with the labor controversies that arise in the IT industry, a reputation that became enshrined for posterity on May 21, 2018 when the U.S. Supreme Court ruled 5-4 in the company's favor in the case of Epic Systems Corp. v. Lewis. In his opinion for the majority, Justice Neil Gorsuch ruled that federal law allows Epic and other employers to force employees to settle disputes through arbitration — a private system of dispute resolution — rather than through the court system. Further, companies can require each employee to follow the arbitration process on an individual basis, rather than banding together with other workers to address a common grievance. In the case of Jacob Lewis, an Epic technical writer who sued the company, the grievance was that it illegally deprived him and several co-workers of overtime pay. As Wisconsin Public Television's Here & Now explained in a May 25, 2018 report, Epic workers had to accept arbitration clauses as part of their employment contracts. In his ruling on the lawsuit, Gorsuch sought to reconcile two major pieces of federal labor law by declaring that they weren't in conflict in the first place. The National Labor Relations Act, first enacted in 1935, gives employees the right to act collectively to protect their workplace rights; the lawsuit argued that the arbitration clause in Epic's employment contracts violated this law. The Federal Arbitration Act, enacted a decade earlier in 1925, requires courts to respect arbitration agreements and the results of arbitration proceedings so long as they don't violate any other federal laws. Gorsuch's answer to apparent tension between the laws is to interpret the National Labor Relations Act narrowly, saying it only applies to collective bargaining through unions, not collective action through a class-action lawsuit. "It may permit unions to bargain to prohibit arbitration," Gorsuch wrote of the 1935 law. "But it does not express approval or disapproval of arbitration." Justice Ruth Bader Ginsburg wrote a dissenting opinion in Epic v. Lewis that said the National Labor Relations Act "speaks more embracively" than Gorsuch's interpretation, guaranteeing employees' rights not just to engage in collective bargaining but also to take other actions to protect their rights, even if they're not organized into a union. Without a right to sue collectively in a class-action lawsuit, an employee is at the mercy of the arbitration process, or at best can sue as an individual, potentially shouldering massive costs without a class of fellow plaintiffs to help pay attorney fees. "The inevitable result of today’s decision will be the underenforcement of federal and state statutes designed to advance the well-being of vulnerable workers," Ginsburg wrote. "Violations of minimum-wage and overtime laws are widespread," she added, referencing two of a variety of issues on which workers may wish to challenge their employers. Observers have noted that the ruling has potential implications for a variety of workplace issues ranging from sexual harassment to wage theft. Proponents of arbitration clauses frame their use as a freely chosen agreement between two parties. But an employer setting those terms has the upper hand. A prospective hire can walk away from a job offer with a mandatory arbitration clause, but may very well needs its income to get by. Additionally, it may be difficult to find a job that doesn't impose the same requirements, given that arbitration clauses have become more and more common. According to a 2017 study from the liberal-leaning non-partisan non-profit Economic Policy Institute, more than 55 percent of American workers are now bound by mandatory arbitration clauses. Faulkner said in a statement after the Supreme Court ruling that arbitration agreements provide a "fair forum" for employees to address their grievances. Critics of arbitration clauses see them as part of a broader effort to limit workers' rights. Arbitration is something like a private court system, and takes away some of the public limelight a company faces when fighting a labor dispute in open court. Employers don't face the deterrent of potentially hefty legal bills as they might in a lawsuit, and because arbitration proceedings are largely confidential, it's also less likely that a company would be held accountable in the court of public opinion. "One thing that's important to understand is that employees on the job market don't seem to have much choice … in terms of shopping around, it's difficult to find positions without these arbitration clauses," University of Wisconsin Law School professor Steph Tai explained in a May 22 interview with Wisconsin Public Radio's Central Time. Tai pointed out that employers in an arbitration process are also employing the arbitration firm that runs the process. One reason class-action lawsuits are an effective tool for employees suing their workplaces is that such suits are often over relatively small amounts of money, often less than what legal representation would cost for an individual in a the process. Banding together as a group to cover legal fees makes it far more practical for employees to go to court. Additionally, prospective employees also go into the job search knowing less about the terms of employment than their potential employers, Tai said. "One thing that a lot of these employment contracts have is also confidentiality agreements," Tai said. "A lot of times these employment contracts aren't available to the public. So if you're a random person looking for a job, you won't know going into the job, before interviewing and stuff like that, whether or not that employer will have an arbitration clause in their agreement." Employees at Epic's whimsical campus in Verona, a suburb of Madison, probably aren't the first people who come to mind when people think of vulnerable workers. Executives in Silicon Valley and elsewhere in the tech industry tend to portray their companies as transcending the us-versus-them dynamics of bitter labor disputes, and generally oppose unions. But there's always a power dynamic between employer and employee, and Epic and its founder Judy Faulkner wield a lot of power. The company's medical records system is used for more than half of Americans, and it has received a number of state and federal government contracts over the years. Faulkner is among the wealthiest women in tech, with her net worth standing at $3.7 billion as of May 2018. Faulkner is philanthropically active and she regularly makes political contributions to candidates, mostly Democrats like Tammy Baldwin and Russ Feingold and party campaign committees, but also to outgoing Speaker of the House Paul Ryan, a Republican. The fact that Epic is Dane County's largest private-sector employer alone gives it considerable pull. 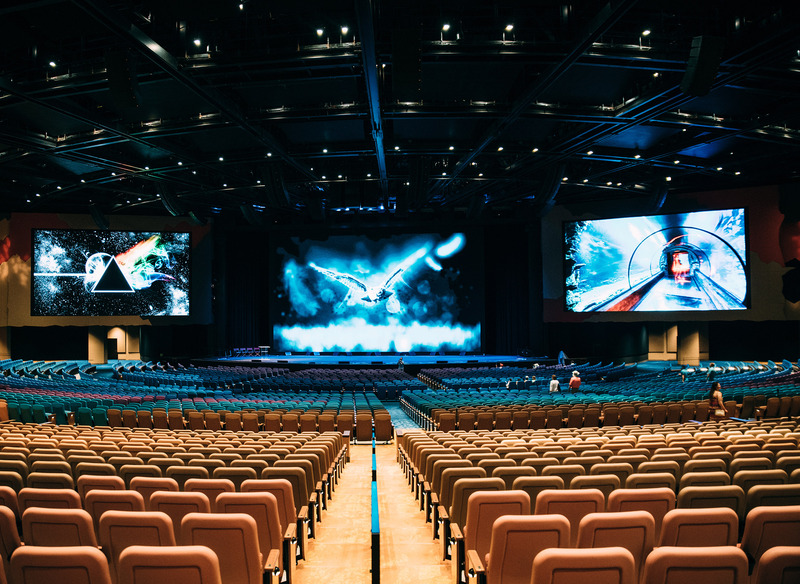 The Deep Space auditorium on the Epic Systems campus in Verona can seat more than 11,000 people. Epic Systems has a local reputation for burnout among workers; the company hires young employees from a range of educational and work backgrounds but asking them to put in long hours and make intensive commitments. Some employees depart to start their own health care IT businesses. "Optimizing Epic software after installation has become a booming industry for consulting companies — Nordic, Sagacious, BlueTree and lots more — that recruit the steady stream of Epic burnouts who've tired of the company's demanding pace," Madison weekly newspaper Isthmus noted in 2014. Epic v. Lewis is hardly the first labor controversy at the company. It has been called out for its use of non-compete clauses, which limits options within the industry for employees who leave the company, as well as hindering the growth of other health-tech companies in the Madison area. In 2014, Epic reached a $5.4 million settlement with a group of workers who claimed they were illegally denied overtime pay. Another suit dealing with overtime pay at Epic is ongoing, but may end up being moot in light of the U.S. Supreme Court's decision. Epic and Faulkner have left their mark nationally and locally, driving digitization in the healthcare industry and demonstrating that Madison's economy can be much more than state government and the University of Wisconsin System. But Epic v. Lewis — a case that helps companies bar employee access to the civil court system — will be a major part of that legacy as well.